Chichester Roman Week 2018 has been shortlisted as a finalist in the prestigious Beautiful South Tourism Awards for Excellence 2018, in the category 'Tourism Event of the Year'. This news means that the annual week-long event, run by The Novium Museum , will receive either a gold, silver or bronze award at the tourism awards ceremony in December. 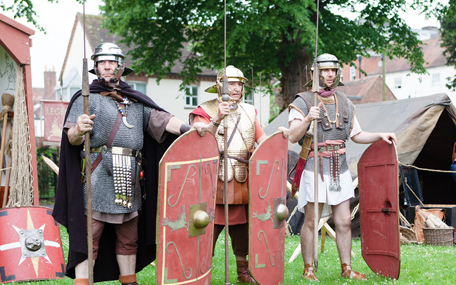 Chichester Roman Week takes place during May half term each year and brings Roman history to life with a variety of events in and around the Chichester District. Grant funding from the Roman Research Trust and the Roman Society funded the headline event during the week this year - a Roman Re-Enactment in Priory Park, which attracted more than 2000 visitors throughout the day. Chichester Roman Week 2018 also received backing from a number of local organisations, including the Chichester BID and the Chichester Farmer's Market, who worked in partnership with The Novium Museum to organise a one-off Roman themed market in Chichester City Centre, the site where the Roman Forum would have been. A number of local business and attractions run their own Roman Week events, allowing the celebration of our Roman heritage to reach the wider Chichester District. Councillor Eileen Lintill, Cabinet Member for Community Services at Chichester District Council says: "It is a fantastic achievement for Chichester Roman Week to have been recognised in these prestigious awards. Chichester Roman Week includes a programme of exciting and educational events which encourage visitors of all ages into Chichester City Centre each May half term. Reaching the shortlist of such a prestigious award is a real testament to the hard work of the museum team." Nigel Smith, CEO of Tourism South East, said: "The Beautiful South Awards are a reminder of the amazing wealth of fantastic tourism businesses and experiences that the South East of England has to offer. The standard just gets better and better which is a reflection of the investment taking place in the industry and the professionalism of the people who work in this important sector. Some very fine businesses narrowly missed the cut so the finalists truly are the best of the best." The Beautiful South Awards for Excellence celebrate the best of the South East region's tourism industry. The awards are organised by Tourism South East and judging takes into account the entry form, along with a combination of web searches, emails, telephone calls, visits and value for money. This year saw 121 entries from across the South East, and Chichester Roman Week has been shortlisted alongside Airbourne - VisitEastbourne, Festival of Flowers - Leeds Castle and Royal Tunbridge Wells Together. Awards will be announced at a ceremony taking place at The Grand Hotel in Brighton on 5 December 2018.